Even ardent fans of Andy Warhol (1928–1987) may be surprised to learn that the artist created a significant body of western work. In fact, Warhol was drawn to the lore and lure of the American West throughout his life. He was heavily influenced by the mythology and iconography of the American West, conveyed primarily through film and television, and revealed at various points in his life by toys, clothing, and travel. His lifelong fascination with the West culminated with his 1986 series Cowboys and Indians, a print portfolio that represents an important milestone in the artist’s late career and a shift in the conception of contemporary western American art. One of the last major projects Warhol completed prior to his death, Cowboys and Indians received very little critical or public attention at the time of its release and remains one of the most understudied aspects of the artist’s career. 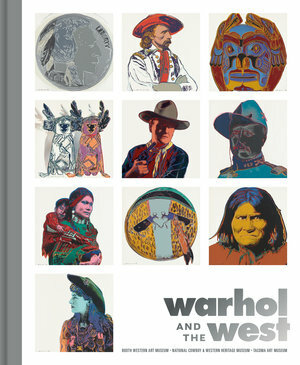 Warhol and the West explores for the first time the range of western imagery Warhol produced. New scholarship examines how Warhol’s western work merges the artist’s ubiquitous portrayal of celebrities with his interest in cowboys, American Indians, and other western motifs. His work in the western genre is immediately recognizable, impressive, daring, inspirational, and sometimes confrontational. This body of work furthers our understanding of how the American West infiltrates the public’s imagination through contemporary art and popular culture. The major traveling exhibition includes more than 100 objects and works of art including source materials revealing Warhol’s process. The accompanying catalogue will feature essays by heather ahtone of the American Indian Cultural Center and Museum (AICCM) in Oklahoma City, Faith Brower of the Tacoma Art Museum, and Seth Hopkins of the Booth Western American Art Museum, as well as 12 additional contributors: Tony Abeyta, Sonny Assu, Gregg Deal, Lara M. Evans, Michael R. Grauer, Frank Buffalo Hyde, Thomas S. Kalin, Gloria Lomahaftewa, Daryn A. Melvin, Andrew Patrick Nelson, Chelsea Weathers, and Rebecca West. Published in association with Tacoma Art Museum. heather ahtone is the Senior Curator at the American Indian Cultural Center and Museum (AICCM) in Oklahoma City, Oklahoma. Faith Brower is the Haub Curator of Western American Art at Tacoma Art Museum in Tacoma, Washington. Seth Hopkins is the Executive Director of the Booth Western Art Museum in Cartersville, Georgia.